The father-and-son team of Transito and Jonathan Leiva (pronounced LAY-vah) opened the store a month ago and are busy stocking the display cases with show-stopping designs and precious gems. A master jeweler with more than 40 years of experience, Transito (known to his long-time customers as simply “Leiva”) specializes in creating custom pieces and repairing all types of jewelry. Although he has been a jeweler in Tampa for 26 years, this is the first time he has launched a storefront business of his own. Jonathan believes the New Tampa locale is advantageous for Leiva’s new business because it’s one of the fastestgrowing areas in the region, and he reports that the new Leiva’s Jewelry is already getting an enthusiastic response from the community. Walk into the store and you’ll see a photo of Transito with client and former Tampa Mayor Pam Iorio, and Transito will tell you he is pleased to design pins for USF and to have USF President Judy Genshaft as a client. Since some customers drop off thousands of dollars worth of valuables, Jonathan says trust is a serious consideration when choosing a jeweler. Interestingly, trustworthiness is the trait that got Transito involved in the jewelry industry in the first place. When he came to America from Nicaragua 46 years ago, Transito worked as a janitor in a factory on W. 47th St., in New York City’s famed “Diamond District.” While cleaning, he says he often found gold and other valuable items and immediately turned them in. The owner of the business was always impressed by Transito’s honesty. 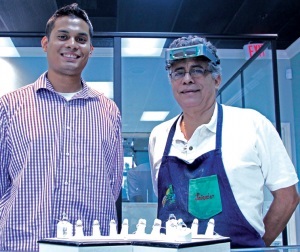 After five years, Transito opened his own business while continuing to work at the diamond factory. Tiffany & Co. and other high-end jewelers would often send jobs to him. After spending 16 cold winters commuting from the Bronx to Manhattan, he decided to move to Florida to raise his family. Jonathan and one of his sisters are in the jewelry business, while another is a hair stylist, and the youngest, well, she is not in the business of making or selling jewelry but is at an age when she might want to play with it! That’s because Transito and his wife, Angela, 38, last summer adopted a two-year-old child from Nicaragua. They named her Angelina after actress and humanitarian Angelina Jolie. “It was always in my heart that I wanted to help someone from my country,” relates Transito, who also has spent a dozen years doing missionary work in Nicaragua. He visits the country four times a year and, on behalf of City Life Church in Tampa, works to help impoverished communities in his native country. Jonathan, who manages and coowns Leiva’s, and his wife, Lauren, have a five-year-old son named Elijah. Jonathan became involved in the jewelry business approximately six years ago and describes himself as his father’s apprentice. Together, they welcome you to stop in and browse Leiva’s own amazing designs of rings, necklaces, earrings and pendants, which he crafts primarily using gold and silver. The store also features jewelry by Colore, Design by Yagi, Reactor and G-Shock watches, and engagement ring settings by various New York distributors. Gems found at the store include sapphires, pearls, rubies, emeralds and diamonds. While you’re there, take advantage of the opportunity to drop off the broken necklace and watch that have been sitting in your jewelry box forever because you haven’t gotten around to having them fixed (you know who you are!) Leiva’s Jewelry does repairs and can also install new watch batteries. Most repairs have a 24-hour turnaround. If your Rolex watch needs to be repaired, Leiva’s will take care of sending it to an authorized Rolex jeweler, ensuring the use of only Rolex parts. For couples getting ready to tie the knot, Leiva’s also offers a complete line of beautiful bridal jewelry. If you’re looking for uniquely beautiful custom-designed rings, earrings, necklaces or bracelets, visit Leiva’s Jewelry in the New Tampa Center. “Whether people are looking for engagement or wedding rings, or choosing a new setting, we have many designs to choose from,” Jonathan says. Because jewelry is such a personal gift, Transito stresses the importance of getting to know his customers. “I am in this business because I like people,” he says. And people like the Leivas, too. South Tampa resident Jim Mutascio met Leiva and Jonathan six years ago when he lived in New Tampa. Now Jim travels here to visit the master jeweler. “It’s worth the trip for anybody,” Jim raves. “He is the best jeweler I’ve found in the area.” He has purchased custom-designed gifts for his wife, daughter, son and grandchildren. With the number of customers who have followed this master jeweler around Tampa, it’s evident that the Leivas make their clients happy!